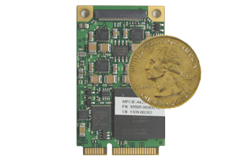 Alta Data Technologies’ MPCIE-A429 Mini PCI Express F1 interface module offers a variety of ARINC-429/575/717 channel configurations with software selectable RX/TX channels, baud rates, bit encoding and word configurations (Start/Sync/Stop length, Parity, bits/word, MSB/LSB). Encode or decode almost any ARINC-429 transceiver compatible signal. 6 Channels of ARINC-419/429/575/717 Channels: 2 RX/TX and 4 RX Only Channels. A/D Capture on First RX Channel! The MPCIE-A429 Transmit capability includes both simple and complete frequency control options for each channel and Playback and Signal Generator modes. Three Receive (RX) functions including channel and multi channel levels. The card design is based on the industry’s most advanced 32-bit ARINC FPGA protocol engine, AltaCore™, and a feature-rich application programming interface, AltaAPI™, which is a multi-layer ANSI C and Windows .NET (MSVS 2005/08/10 C++, C#, VB .NET, LabVIEW, RTOS) architecture. Here you can find documentation pertaining to the MPCIE-A429. For additional documentation and software, please visit our secure download area. MPCIE-A429-6 Mini PCI Express Full Size F1 with 4 Shared Tx/Rx Channels and 2 Rx Channels of ARINC-429 and 1 Rx/1 Tx ARINC-717 (717 Rx/Tx Replaces Two 429 Channels). Included: AltaAPI Software.